HP choose us like OFFICIAL WEB RESELLER. This is a guarantee for. 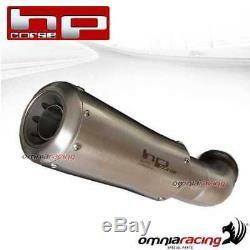 HPCORSE GP07 exhaust slip-on inox satin for KTM SUPERDUKE 1290GT 2016>2018. The kit includes the link-pipe (where necessary) and all the mounting pieces. The Exhaust are developed with the original ECU, so the assembly does not require the remapping of the same, or the assembly of additional ECU's. HP CORSE GP07 INOX SATIN cod. Exhaust slip-on low (cup with ring in aluminium anodized) + link pipe for original collector. An exhaust slip-on with strong emotions. The GP07 is the shortest and compact exhaust terminal produced by HP CORSE, born to guarantee to every motorcyclist strong emotions. With sinuous and soft lines, created with new construction technologies and with all the passion of the artisans HP CORSE. The cups are in hand-brushed steel, the welding of this terminal rigorously executed by hand, left exposed to further enhance the craftsmanship and construction of this exhaust. This terminal can be equipped with 2 different outlet nozzles: In aluminum obtained from solid and with metal mesh. Hp CORSE, company based in Bologna begins its partnership with STEELFORM Udine company for the production of motorcycle terminals. In 2009 the HYDROFORM project comes to life, on design and development by the laboratories HP CORSE and metal processing by STEELFORM company specialized in processing and deformation of metals. HP CORSE it will remain the nerve center in the design of each component, STEELFORM's task will be to translate project work into terminals, exhaust slip-on and special link pipe, perfect in design and style, totally made in Italy. From July 2015 the 2 companies have expanded the product range with EVOXTREME and HYDROTRE (Totally designed for MV AGUSTA). HP racing and STEELFORM now follow in the footsteps of a great worldwide success which promises to become a model of absolute development in the world of entirely crafted special exhausts created in Italy. Casing: special stainless steel with variable thickness. Surface finishes: satin and black satin. Sound-absorbing material with high sound absorption capacity. Stainless steel rivets in watertight. Logo engraved with the laser beam. Weight 990 gr (without DBK and fitting). In 1994, the Passion and Experience of Fabrizio Bertollini created OMNIA RACING , with the aim of representing a reference point for everyone fond of bikes. In 2000, when Salvatore Orefice joins OMNIA RACING , the OMNIA RACING Special Parts project is founded, a society based on the passion and competence needed to create and trade the top products for motorbikes. Our continuous search for perfection and performance, using advanced technologies, has allowed OMNIA RACING Special Parts to interact with internationally famous pilots and teams. Our products are excellent for both road and circuit use. They are constantly tested by our technicians and pilots, thus improving the techicnal, dynamical and structurale features of the materials adopted and of the special parts produced. The experience gained through the years has permitted Omnia Racing Special Parts to be extremely selective in the choice of the firms and of the products distributed. Accostato, Afam, Aim, Akrapovic, Andreani, Arrow, Bazzaz, BC battery controller, Bitubo, BMC, Braking, Brembo, BST, Capit, Castrol, Derry Moto, Diapason, DID, Discacciati, Eibach, EK, Fabbri, Far, FrenTubo, Galfer, GBRacing, Giannelli, Gifrap, Givi, Gopro Hero, GPT, H2O, Hagon, Ixil, JollyMoto, Kappa, Laser, LCR selle, Leovince, Lightech, Mafra, Marchesini, Marvic, Marzocchi, Matris, Mivv, MRA, Nissin, Ohlins, PBR, Polini, PT, Rizoma, RME, Robby Moto, Sachs, STM, Stomp, SuperB, Suter, Termignoni, Valtermoto. OMNIA RACING Special Parts is in close contact with its customers, taking part to several important events: Bike Expò Padova, national and international races, free circuit sessions. On the web, our "on-line shop window" is always associated with a direct contact with the customers, so as to suggest them the product that best suits their needs. This should allow our customers to feel at ease and to trust us. All this has allowed us to become, in less than a decade, a reference point in Italy; in addition, our products are increasingly demanded also in Europe and in the US. L'item "HPCORSE Pot D'Echappement GP07 KTM SUPERDUKE 1290GT 162018" est en vente depuis le mardi 27 mars 2018. Il est dans la catégorie "Auto, moto pièces, accessoires\Moto\ pièces détachées\Systèmes d'échappement\Silencieux, déflecteurs". Le vendeur est "omnia-racing" et est localisé à/en IT.